Ultrasound examinations during pregnancy are a common procedure in our time and they are supposed to be harmless. The fact that potentized Ultrasound often is a very beneficial remedy in the treatment of children with ADD, ADHD and ASD, suggests something different. In order to find out what the unborn baby might experience, a proving and a Shameeah were done. Shameeah is my personal style of a C4-Trituration, very much influenced by my Native teachers. It is a sacred ceremony of communication with nature. When the 10 participants met for the Ultrasound Shameeah, eight of them had undergone a Hahnemannian proving of Ultrasound 30 C in the weeks before. Seven of them had symptoms that did not fade away after the end of the proving. The provers complained about pain in many joints, including knees, fingers, jaws, the neck and all along the spine. When I had heard about the joint pains, at first I did not understand. Thinking about it, however, I realized that this is exactly what Ultrasound treatments are used for in physiotherapy. We can easily recognize the homeopathic principle: Ultrasound can create it and Ultrasound can heal it. I had been invited to complete the proving with a Shameeah ceremony. In a Shameeah ceremony we go into higher vibrational levels than in a proving and as we reach the spiritual level, the physical problems usually disappear. In an alchemical process the problems are transformed into a gift. This happened here too. When the Shameeah was completed, I offered a special teaching about how to deal with lingering symptoms after a proving. Nobody was interested anymore, since the problems had disappeared. The raw material that we used for the trituration was water that had been treated with ultrasound waves. The transducer of an ultrasound machine of the obstetric department of a hospital had been immersed in a small amount of water which then was treated for five minutes with a frequency of 3,500 mhz which is used for pregnant women in transabdominal examination. A few drops of the water were triturated in lactose. In the first hour of a C4-trituration, the C1-level is reached which is characterized by mainly physical symptoms. In the second hour, in C2, generally emotional problems appear. C3 is about the mental level and we start to understand what we had been going through so far. In C4 we are allowed to touch the essence, the core of a remedy which is a deeply spiritual experience. Here the problems that we had experienced in the lower levels usually turn into a blessing, into a gift. This is a very short and simplified explanation of the intriguing energetic process of a Shameeah / C4-Trituration. Let us now talk about the experiences and the result of the Ultrasound Shameeah. In C1 seven of ten participants reported headaches. Everybody felt warm or even hot. A burning emptiness and nausea was felt in the stomach. Even bones were affected with emptiness: “My bones feel as if they had holes.” A fine tremor of hands was noticed. An uncomfortable vibration permeated the whole body. It was described as shivers, as vibration or as a buzz. I would like to make a comment to the connection with coffee that was strong during the whole process. Even people who usually do not drink coffee had a desire to do so. How can that be understood? Coffee creates a state of over-stimulation and hurry as did the Ultrasound in our trituration. In drinking coffee, we create an internal buzz which then helps us to relax in the energetic field, in the similar buzz of the Ultrasound. It leads to an unhealthy harmony between the inside and the outside, which gives relief. It acts like a medication. This helped me to understand ADD-children who often need a running TV or music in order to learn. They simply create a kind of harmony between the inside and outside that helps them to focus. In C2 the intensity of the vibration in the physical body was less pronounced than in C1. However, its effect on our psyche was perceived more clearly and more painfully. A beautiful symbolic description of what happened was the image of a participant who experienced to be in one of the big European cathedrals. “I am in the highest peak of the cathedral, floating. I am being pushed up against the ceiling. I need to get out, to get higher but the ceiling stops me. I am stuck there between heaven and earth.” This is an impressive description of a fetus being in the sacred space of the womb and being almost pushed out, wanting to get away, wanting to escape but not being able to. We truly could feel what the unborn was going through. “Is there nothing sacred or holy anymore like creation or nature? You are exposing mystery, the mystery of life. You think this is the beginning? It is the end! You think you are saving lives. How many more are harmed? We need quiet, dark to grow. Too much light too soon is exposure. Some things must kept secret and hidden until the time of birth is imminent. Everybody felt disconnected and separated. Here, the need to be alone is simultaneously a pathology and an attempt of healing. When we are overwhelmed by the world as adults, we also withdraw, we need to be alone, we might meditate. All this is a way to restore the inner safe space, the sacred space deep inside each one of us where we are not in relationship with the outside world, where we are safe within ourselves. In a way this is what children automatically do in the spectrum of autism. It is both an expression of their problem and of a way to heal or at least to medicate it. “In the break I read a face book posting of a single mother of a 17 year old autistic son. She wrote: We are becoming more and more confined to the house. I cannot handle to be in public anymore, his melt downs are too severe. His confinement is my confinement, we are in this together. Looking for a way out, a way out of the torture of living in a body that had been violated. Most of the participants were very unsettled. We were yearning for connection, for love, for a turn-around, for the solution that we usually find in C4. What we experience in the level on which the transformation is happening, is not part of the remedy picture. It is beyond proving, it is the gift after having gone through the problem. 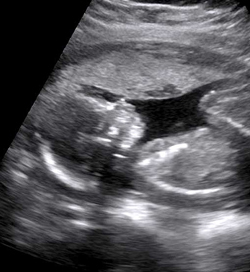 What we experienced leaves little doubt about how uncomfortable an Ultrasound examination is for a fetus. It has the potential to destroy the sacred space of darkness and safety in a mother’s womb. It results in an over-stimulation of the senses. It leaves the unborn with a confused sense of self, resulting in a very uncomfortable feeling of emptiness. As avoiding it is not possible, the baby is likely to shut down, to disconnect and it will try to save at least what is left of a sense of identity by avoiding contact. It is very possible that in sensitive babies and in cases of frequent and extended Ultrasound exposures this can promote a tendency to autism. During the trituration remedies were mentioned that might be helpful to restore the sacred space in a child. As the integrity and autonomy of a baby can be compromised by Ultrasound investigations during pregnancy, we can expect that during a treatment remedies might come up from the 3rd row of the periodic table (confusion of identity) and Lanthanides (restoring autonomy). As is the case for vaccinations, it might also be that the use of Ultrasound during pregnancy promotes an evolution of Lanthanide problems in children. Silica was a remedy that came up repeatedly, the connection being that in technical ways Ultrasound waves are both sent and received in using quartz crystals. I do not know if Silica would be a remedy to treat negative effects of Ultrasound. Remedies that can restore the jarring of the nervous system and which had been mentioned during the Shameeah were Hypericum and Aurum. Hypericum is well known for its powerful action potency on damaged nerves. Aurum could almost be called a specificum to restore a space of inner darkness that is untouched from the outer world. I want to express my highest respect to the participants of this Shameeah, who were students and teachers of the Western College of Homeopathic Medicine in Calgary. Many of them were mothers themselves being very aware of the challenges of raising children in our time. I want to acknowledge and give thanks for their courage to go into an unknown and very uncomfortable energy in order to find out what babies might experience when we expose them to Ultrasound. With their sacrifice and suffering they gave a voice to the unborn who cannot speak for themselves.